Back in November 2016, I bought really cute cactus print double gauze while I was in Japan. 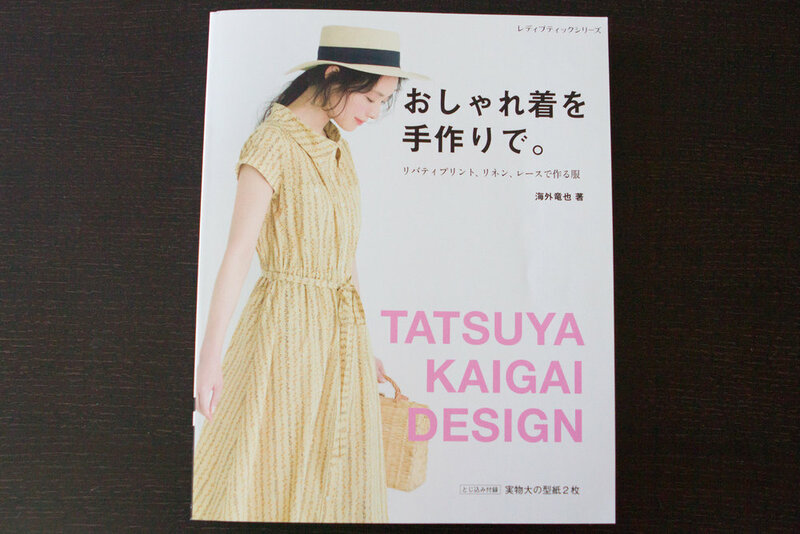 I also bought this Japanese sewing book featuring a pretty shirt dress on its cover. I fell in love with the collar... It's button down design but has a larger neck opening than a regular buttons down shirt! I wanted to combine the two to make a summery fun dress. It is a pretty shirt dress pattern but since I was using double gauze fabric, I was a bit worried that the dress would have too much volume with all the gathers on shoulders and around the waist. Also the sleeves are a tad shorter than I like them to be. So, I decided to hack McCall's M7351 , basically used the M7351 for the bodice and sleeves and switched the collar to the one from the book above. The book actually has a shirt version of the pattern which has slightly smaller and less pointy collar, I decided to go with that version this time. And minus the buttons on the tips of collar, so mine is not a "button down" shirt dress but it's a "button up" shirt dress. I adjusted the neckline area of the M7351 to fit the collar from the book. I've also changed the skirt to gathered one instead of a circle skirt. I love the circle skirt on the pattern, however, the fabric I used this time had a directional print, so I thought gathered skirt would work better. I'm really loving my button choice here, aren't the yellow buttons so sweet?! They match with the colour of cactus flowers if you look closer. I don't know a proper way to fix the neckline in this kind of case, so I sort of winged it. Luckily it worked fine I think! I added some ease to the waist but I added a bit too much. Now, having an ease is actually a good thing during summer (tight/fitted clothes make me feel warm and I easily get warm to begin with) , but next time I'll take off that ease a bit. Also, the bodice sits too low for me, so I'm going to have to take off about 2cm (maybe) so that it sits on my natural waist. This dress isn't lined by the way (only the back yoke part is lined, but more like facing.) With unlined dresses, I usually wear a thin cool material cami and a half slip made with bemberg. But I think I'd be more comfortable in a slip instead, that would also avoid unwanted extra volume around the waist... I have a black slip, but would be nice to have white/creme colour one for summer. I'm thinking maybe trying out lengthening the Ogden cami pattern.